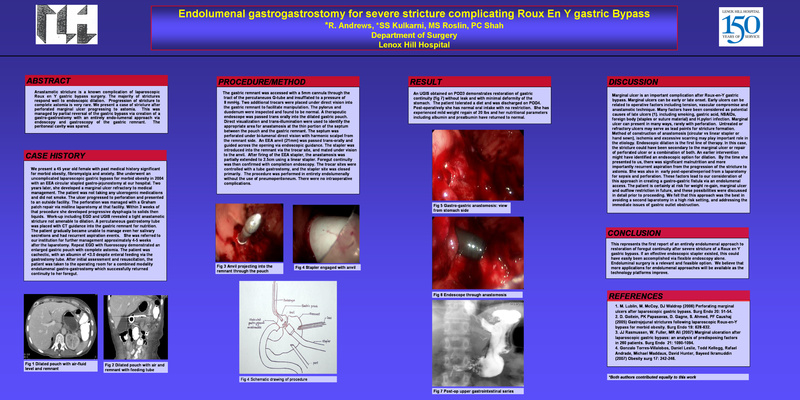 Endolumenal gastro-gastrostomy for astomia complicating Roux-En-Y Gastric Bypass. A 45 year old female underwent an uncomplicated laparoscopic (divided) gastric bypass with circular stapled gastro-jejunostomy. Two years later, she developed a marginal ulcer which perforated and was treated with open Graham patch repair. Within 2 weeks post operatively, she developed progressive dysphagia. EGD and UGIS revealed a tight anastamotic stricture not amenable to dilation. A percutaneous gastrostomy tube was placed into the gastric remnant for nutrition. The patient rapidly progressed to complete astomia. She was cachectic and unable to manage her salivary secretions with recurrent aspiration episodes. She was referred to our institution for further management. Given the hostile nature of the abdomen, the astomia, and the severe weight loss of the patient, we elected to perform an endolumenal gastro-gastrostomy to restore foregut continuity. The gastric remnant was accessed with a 5mm cannula through the tract of the percutaneous G-tube and insufflated to a pressure of 8 mmHg. Two additional trocars were placed under direct vision into the gastric remnant with trans-illumination guidance. An endoscope was passed into the gastric pouch. Direct visualization and trans-illumination were used to identify the appropriate area for anastamosis at the thin point of the inter-lumenal septum. The septum was perforated under bi-lumenal direct vision with a harmonic scalpel. An EEA anvil was passed trans-orally and guided across the opening via endoscopic guidance. The stapler was introduced into the remnant and mated under vision to the anvil. After firing of the EEA stapler, the anastamosis was extended using a 45mm GIA stapler. The procedure was performed in its entirety endolumenally, without peritoneal involvement. There were no complications. An UGIS performed on POD 2 demonstrated restoration of gastric continuity without leak. The patient tolerated a diet and was discharged on POD4. This represents a novel, entirely endolumenal approach to restoration of foregut continuity after astomia complicating a Roux en Y gastric Bypass. While it is possible that weight regain may occur following this reconstruction, it offered the least invasive approach to controlling the immediate problem.